No gaming this week... again. I'm starting to see a trend here. But, I did manage to pick up a handful of bits from another Old Timer who was thinning out his collection of unused stuff. 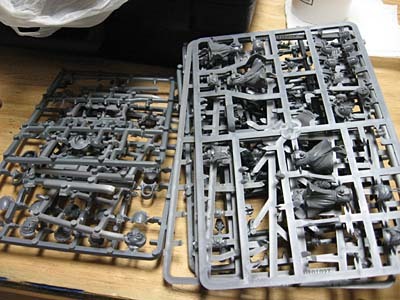 I grabbed all the plastic stuff I could in order to fill in a few holes in my bits collection. I try to keep things on hand to help with commissions and keeping the prices down for clients. Sometimes it saves them from having to spend a silly amount of money for a particular bit if I already have a one of them in stock. 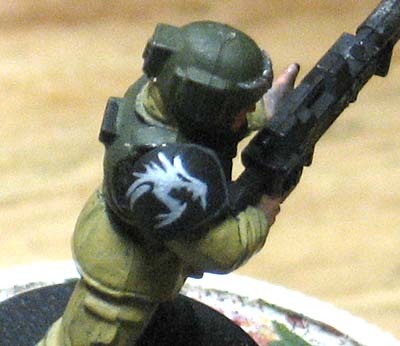 I spent a few minutes painting up an Imperial Guard company symbol for one of the other guys. Taking something much larger and complex in design and turning it into an "icon" can take a little bit of work. Sometimes you need to simplify it so that it reads easily when glanced at. There's only so much detail that will fit on an Imperial Guard shoulder pad. Now I know how spoiled I am with painting icons onto Terminator shoulder pads. Trouble is, I broke this little guy's arm off while painting him. I don't think I'll be getting the job to paint the rest of the company icons now. If you haven't ordered a FTW t-shirt, now's the time to do it. If you're one of those who've already ordered, Thank You! I'm looking to place the first order at the end of the month so I can get them out to everyone who has ordered so far. So what if you broke the arm off? Sounds like an assembly problem, no fault of yours. Tell the guy not to use cheap superglue if he wants the arms to stay on! I use Testor's plastic glue myself, of the Model Magic brand.